eBay Package include: jumpsuit+mask(with lens,the lens are non-detachable)	Fabric: elasticity Lycra The jumpsuit and mask are detached. separated 2 pcs. 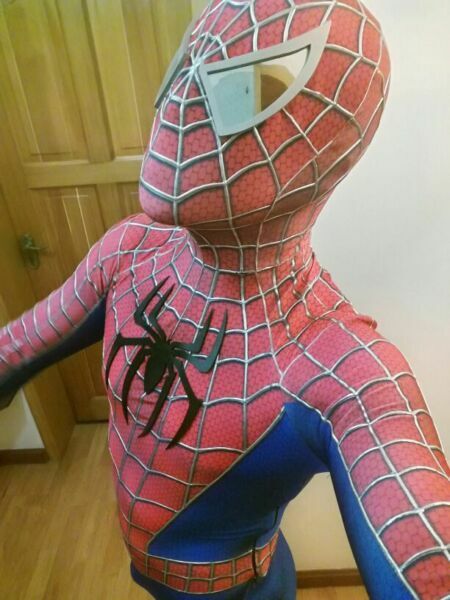 The spider on the jumpsuit has 3D effectThe item will be shipped from China by e-packet.If you need this costume in a hurry, please choose expedited shippingList in Asian size. Please choose size according to size chart belowIf Can Through The Eyes see out: YesIf Include The Soles:NoIf Include The Mask:Yesif The Jumsuit Separation Mask: YesFace shell link(http://www.ebay.com/itm/172834137099)Contact us before you leave a negative feedback if you find any quality problems after receiving the item.Payment1. We accept only Paypal (Paypal allows you to pay by credit card,Debit cards,bank transfers and Paypal account Balances,For more information, please check at www.paypal.com) 2. Only ship to PayPal confirmed address. 3. Payment due within 7days since the day your bid placed.Shipping 1. If you can't get your items in time, please contact to us first, we will check and solve it for you soon 2. Buyers are responsible for any customs duties if applicable. 3. Please make sure your address in eBay is correct. If you want to change the sending address, please give us Ebay message when you fulfill your payment. 4. Combine shipment is not allowed. If you want to combine all the items together, you should still pay for all of the shipping, insurance and handing fees as it charges by weight. 5. We could ship to PO BOX address, but it takes more than 6 days to be deliveredReturn policy 1. We offer refund/exchange costume alteration for defective items/missing items /items significantly different from listing description. Buyers should contact us within 14 days of delivery of items and email us photos to support the claims. 2. If you are not 100% satisfied with the items for other reasons and ask for refund. Please be noted that only the listing price excluding shipping fees would be refunded. 3. Buyers are responsible for returning the items in their original conditons within 2 weeks of delivery of items at their own expense through registered mail with online delivery tracking number. 4. For Custom-made Costume, It is important to offer us the correct measurements. Size problems,custom-made items, no return accepted. About usallencose is World Top Brand for Cosplay Costumes and Accessories.We welcome International buyers from all parts of the world, and in the past few years we have sold Numerous of items to satisfied customers in Worldwide. Our company strives to provide superior customer satisfaction and maintain our reputation for honesty.Feedback 1. We would like to earn your good feedback and 5 star DSR rating . Your great comments will make us more confident to develop business and serve you better. 2. If you are satisfied with our goods and service, please kindly take a minute to leave us a positive feedback with an overall 5 Detailed Selling Rating (DSR). 3. If you are not satisfied with our goods or any problem on them, please kindly contact us before leaving negative or neutral feedback, we will find a good way to resolve any issues until you are satisfied.